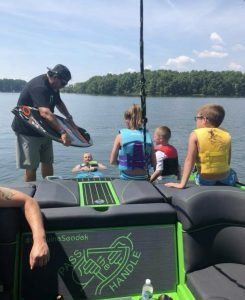 Professional wakesurfer Raya Walker will be giving lessons for several days on Lake Norman throughout the summer. Competing since 2012, Raya finished 4th in the nation in pros in 2018 and has been coaching for 3 years. She teaches all levels of riders, from beginners to the more experienced and skilled ones. Whether it's learning a new competition run or maybe just landing a new trick, Raya will help you progress and take your wakesurfing to the next level.